At the present time no stage act is complete without an illusion. 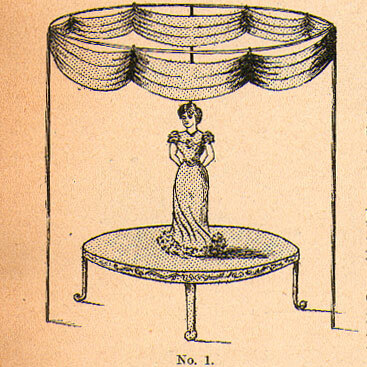 Stage Managers do not welcome the idea of illusion acts, for the reason that the stage is cut here, there and everywhere, to allow the performer to fit his traps. This illusion has been presented to us by Mr. Phillip Levard. stick under and around the platform to prove that no traps or mirrors are used. The curtains are lowered round the lady. A revolver is fired, up go the curtains, and the lady has disappeared. The assistants immediately haul down the fittings and curtains, and then wheel off the platform. The lady appears amongst the audience. Illustration No. 2—A represents mirrors arranged underneath the platform. 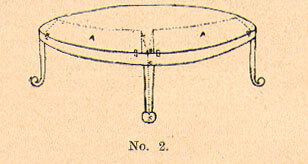 B is a small pulley wheel to which is fitted strong cord, and passed through C C, and proceeds down the centre leg of platform. The end of cord is in the hand of an assistant, to make mirrors ascend, the cord C is pulled, of course when the lady is ready to vanish the assistant slackens the cord, the mirror falls at 45 degrees, the lady then conceals herself behind the mirror. She is then wheeled off the stage. With the aid of stage doors that have an entrance in the pit, she makes her way speedily, and awaits an opportunity to make herself seen.